As you know, FIFA is the world’s most popular football videogame simulator. However, it has not always been so. Find out what happened to make this franchise so successful. In July 1993, modern football was adjusting to a new era. The first season of England’s breakaway Premier League was underway, comprised of 22 clubs that had ditched the Football League for a share of a then-enormous TV deal. Immediately, the influx of cash was felt, and footballers increasingly took on pin-up status. In that 1993 season, Alan Shearer had joined Blackburn Rovers for a British record £3.6 million, while the division’s top scorer and Shearer’s future international strike-partner, Teddy Sheringham, was signed by Tottenham for £2.1 million. The inaugural campaign saw Manchester United crowned as English champions for the first time in 26 years, and their prodigious 19-year-old winger Ryan Giggs named as Young Player of the Year. The footballing landscape was all change – a period of history in the making. With the £304 million splashed out by BSkyB and the BBC for five years of television rights, and highlights to the Premier League and the European Cup undergoing a similar rebranding that season (becoming the Champions League), football was to witness the introduction of a third new, major, game-changing franchise – the debut FIFA video game, entitled FIFA International Soccer, released in the aftermath of that seminal season. It was Electronic Arts’ (EA) first foray into the soccer video game market. Having established themselves in North America since 1988, with their first title – the American Football game John Madden Football – they wanted to break Europe. Research told them that it was the other football that would be their best bet. 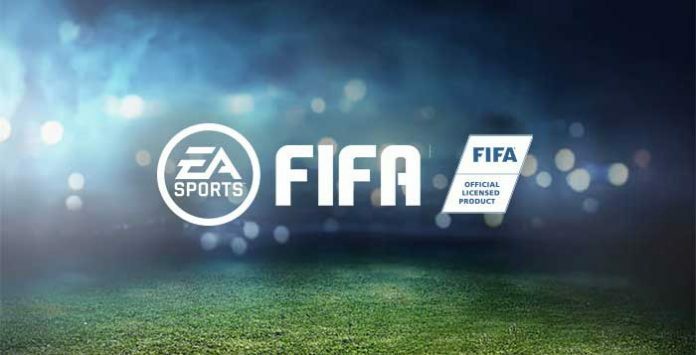 The company had enjoyed success by securing official licenses to their American Football and Ice Hockey titles, so it was only natural that EA made a beeline for football’s governing body, FIFA, negotiating a five-year deal. Though that sounds like a huge commitment, it was actually quite a tentative step. The agreement with FIFA included small royalty payments due to limited licensing: the first release didn’t include any team or player names, logos or stadiums, or graphical likenesses. With a relatively small budget of $50,000 to $100,000 and a tiny team of just ten developers working on it, FIFA International Soccer was a toe dipped into the water rather than a bomb from the high board for EA. Known initially as EA Soccer, the introduction of the moniker ‘International’ indicated the key licensing agreement – the only playable teams in the game were nations. Fictional squad lists took the place of real players. Instead of Shearer, Producer Matt Webster was England’s striker; colleagues Joey Della-Savia (Italy) and Aubanel (France) lined up for their virtual national teams too, while Lead Producer Bruce McMillan put his newborn son into the game by way of tribute. Though the game was coming out the season prior to a World Cup, EA were unable to make that a key element of their offering. The FIFA World Cup license belonged to a rival publisher, U.S. Gold, whose official game would be appearing on shelves in Spring 1994, in the build-up to America’s hosting of the tournament. Quite understandably, all these factors worried EA somewhat – the possibility of disastrous sales a very real one, with no clear USP to the game. In the midst of the confusion and alarm, it was briefly mooted that the game should be branded as Team USA Soccer in North America, to appeal to Americans’ famous patriotism. If more had been made of the World Cup rights issue earlier, it’s a real possibility that EA could have pulled the plug on FIFA and changed the course of video game history. Sensibly, someone could have flagged it as an insurmountable obstacle, and the FIFA series might never have happened. Thanks to the doggedness of the team working on the game – liaising across time zones between Canada and the UK – EA stuck to their guns, predicting healthy sales of 300,000 throughout Europe. U.S. Gold’s World Cup USA ’94 was to be an irrelevance by the time it came out and was the last time the publisher secured the official FIFA World Cup franchise. That’s because FIFA International Soccer was a revelation, reimagining the football video game genre. It was the first to step away from the norm of 16-bit graphics, with an isometric view of the pitch, rather than the bird’s eye view best used by Sensible Soccer, or top-down angle that had also become popular at the time. This unique approach was inspired by a beach volleyball game created by British indie developers Jules Burt and Jon Law. The original FIFA team. 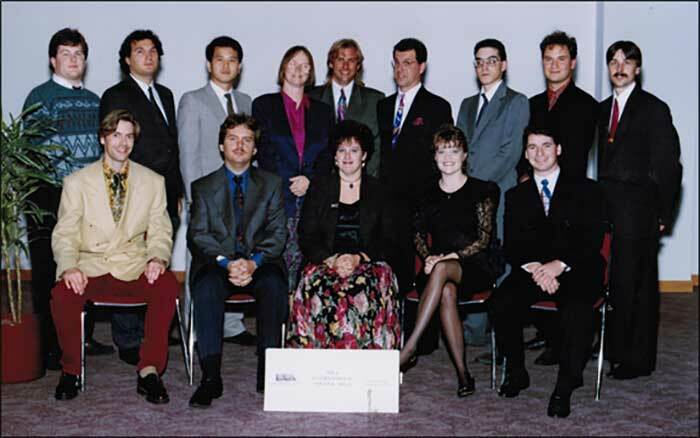 Back row, left to right: Jon Bruce, John Santamaria, Jan Tian, Linda Stansfield, Bruce McMillan, Joey Della-Savia, Lee Patterson, Jeff van Dyck, Kevin Pickell. Front row, left to right: David Adams, Brian Plank, Dianna Davies, Suzan Germic, Mike Smith. Not pictured: Marc Aubanel and George Ashcroft. FIFA International Soccer earned rave reviews upon its debut, with Edge magazine highlighting the relationship between crowd noises and on-pitch action as particularly impressive. GamePro lauded the graphics and animation, while Mega Machines Sega hailed it as the “greatest soccer game yet seen”. Originally released for the Sega Mega Drive – the dominant console of the time – as International Soccer’s success became clear, EA ported it to other devices, including PC, Amiga, the SNES, and Game Boy. FIFA’s success was part of a ground-breaking time in video games – a year earlier, in 1992, fighter game Mortal Kombat had generated worldwide outrage for its gratuitous violence; SEGA’s historic Virtua Fighter debuted in arcades two months before FIFA’s release; while 1994 was anointed as ‘year of the cartridge’ by Nintendo, as their Game Boy took gaming portable. The year’s headlines were stolen by Sony in December, however, as they launched the iconic PlayStation, a year and a month after forming Sony Computer Entertainment. In short, EA’s timing in targeting the European market was impeccable. And who was the man they chose to lead the charge for the maiden title? Erm, David Platt. Then England’s Mr Reliable, the playmaker had just completed a £5.2 million move from UEFA Cup winners Juventus to Italian rivals Sampdoria, and he was chosen as FIFA’s first ever cover star, in a photo showing him taking on Polish midfielder Piotr Świerczewski. Another version, for the later release on the SNES, showed Platt’s Dutch Sampdoria teammate, Ruud Gullit, being beaten to a cross by Irish keeper Packie Bonner. In turn, the Goldstar 3DO release showed the US team’s poster-boy, Alexi Lalas, winning a header against Norway, while the game itself boasted an array of improvements, including a rotating camera effect and enhanced graphics. That second game, which went on sale in November 1994, for the Sega Mega Drive, saw the introduction of club sides from across eight different national leagues, including England’s Premier League, Germany’s Bundesliga, Italy’s Serie A, Spain’s La Liga, France’s Ligue 1, and Holland’s Eredivisie – although the squads still consisted of made-up players as the new licenses again didn’t include real players. Penalty shootouts were the major gameplay addition, rather than the ‘next goal wins’ method used to decide drawn games in its predecessor. The first three covers of the FIFA series. EA’s thirst for licenses is best exemplified by the experiences of Steven McKevitt, who was Head of PR at Gremlin Interactive during the Nineties, and worked on Actua Soccer, a would-be rival to FIFA. Gremlin weren’t the only ones to feel like they were off the FIFA pace in the early nineties – it took EA Sports’ hunger for official licensing to spark the English FA and Premier League into life on what would, later, be a hugely lucrative route. Back in 1993, ‘image rights’ wasn’t a recognised phrase, let alone a standard contract clause – so EA Sports actually played a major part in formalising such detail in English football, when they were trying – unsuccessfully – to secure them. Not that EA Sports were the experts on all things licensing – though they secured the rights to eight national leagues for FIFA Soccer 1995 in that deal, they didn’t manage to negotiate rights for any of the players in those divisions. Oops! 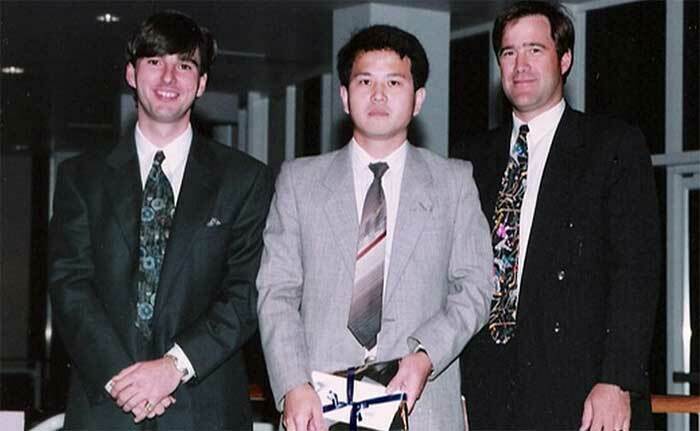 Jan Tian receiving EA’s Outstanding Performance Award from executives Don Mattrick and Bing Gordon, for his work on FIFA International Soccer. Gameplay and stature have come a long way from the series’ beginnings. Lead Programmer on FIFA International Soccer was Jan Tian – probably better known as Janco Tianno the Brazil forward, his in-game alter ego – and he remembers laying the foundations of FIFA clearly. Single-handedly, Tian had created the template for the series to follow for years to come, effectively creating, from scratch, the FIFA game we know and love today. For the first month of the project he worked alone, until he turned to his colleagues – who were busy with other projects – for some feedback. With the stakes suddenly raised by the massively reduced turnaround time, plus the pressure of seeing off the rival U.S. Gold title, the team had to work around the clock to make FIFA International Soccer viable. In order to bring you the best FIFA content possible, we read everything that is published about this game. Our favourite book is ‘FIFA FOOTBALL: The Story behind the Video Game Sensation’ written by Lee Price. The article from this page was taken from there. If you want to read the full book, you can buy it clicking on the banner.